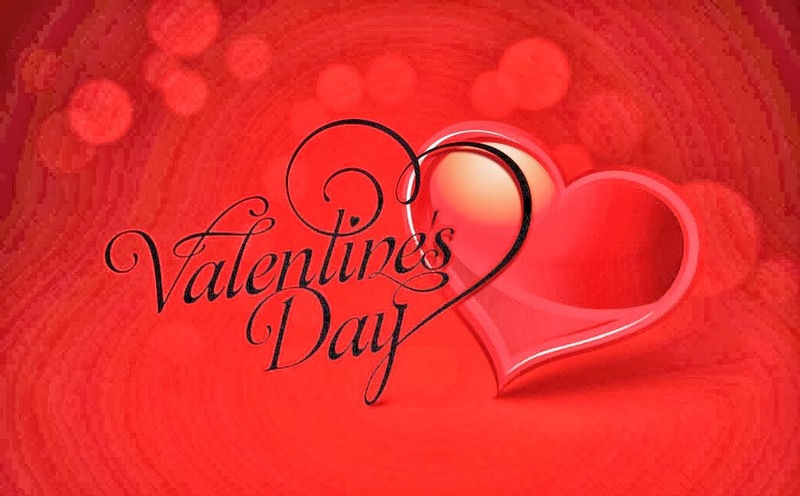 Next week is Valentines…have you decided what to give that special someone in your life to show them how much you totally L-O-V-E them? If you’re having trouble coming up with the perfect gift idea for your food-loving Valentine, I’ve got some great ideas in this month’s Valentine Gift Guide edition of Wendy’s Favorite Things! This month’s Great Eight features something that’s certain to be perfect for your sweetie in a wide range of prices. I've got your covered whether they love chocolate, bubbles…or maybe even a cute calorie-free lunch tote. Check it out! Wild Ophelia, which features American-made ingredients that bring together artisan chocolate and farm and artisan food products. 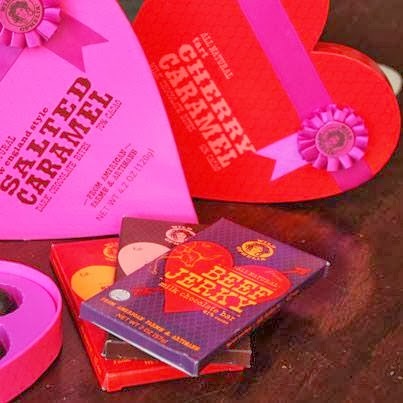 They’re offering classic Valentine heart boxes that are filled with either New England Style Salted Caramel in 70% cacao dark chocolate OR Tart Cherry Caramel in 41% milk chocolate. The caramel is soft and flavorful, making these a decadent little treat. 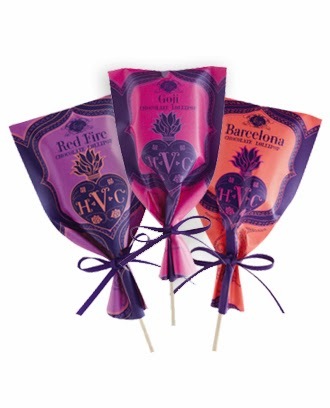 Vosges can be purchased via their online Valentine store, as well as at select boutique locations around the country. The Wild Ophelia caramel heart boxes can be purchased exclusively at most Walgreens locations. (2) Eleni’s Cookies Bee Mine and Conversation Heart Cookie Gift Tin. Eleni’s is a New York-based cookie company that specializes in adorable and delicious hand-decorated sugar cookies. Their cookies are crisp and buttery, and the icing isn’t overly sweet. This year, they’re offering a full line of Valentine-inspired cookies. Two of my favorites are the five-cookie Bee Mine Cookie Gift Set and the 48-piece Conversation Hearts Cookie Gift Tin. 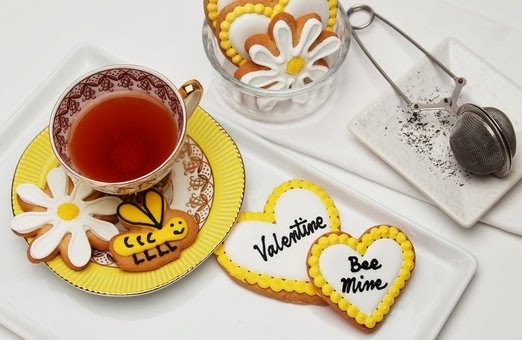 Bee Mine features two daisy cookies, a bumble bee, and heart cookies that say Bee Mine and Valentine. Any Valentine would love to receive this sweet sentiment in cookies! If your special someone loves those cute conversation heart candies that we used to eat as kids, the Conversation Heart Gift Tin is perfect for them. 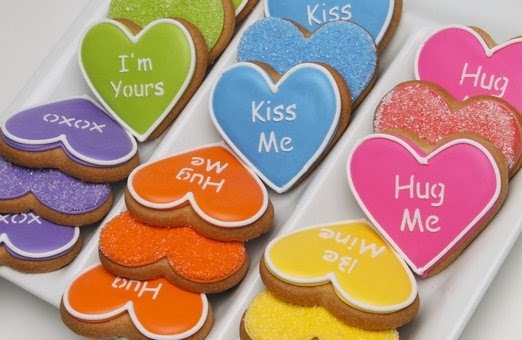 The icing colors that decorate these cookies are vibrant, and the heart-shaped cookies feature some with cute and romantic sayings…and others that are simply decorated with icing and topped with crunchy sanding sugar. Because this gift set contains four dozen cookies, it's perfect for family sharing. Just add milk and you've got the perfect Valentines night dessert!! (3) Sofia Blanc de Blancs by Coppola Winery. Perhaps your significant other prefers to celebrate with a glass of bubbles instead of chocolate or other sweets? Coppola Winery to the rescue! Their effervescent Sofia Blanc de Blancs sparking wine screams romance. The romantic bottle comes wrapped inside pretty feminine pink cellophane. Even better? This sparkler tastes fantastic! Sofia features a wine trio blend: 70% pinot blanc, 15% riesling and, 15% muscat. The resulting flavor profile includes notes of honeysuckle, apple and pear, honeydew, citrus, and a hint of minerality. The average retail price for a bottle of Sofia is $19. Sofia Blanc de Blancs can be purchased online direct from Coppola Winery and at select retailers around the country. (4) Hancock Gourmet Lobster’s Dinner for Two. If you want to treat your sweetheart to a gourmet dinner…but don’t want to deal with the hassle of a long wait at a restaurant…Maine’s Hancock Gourmet Lobster has just what you’re looking for. 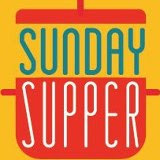 Their Dinner for Two lets you prepare a three-course seafood dinner featuring Lobster Risotto On the Half Shell, rich and creamy Lobster Pot Pie (complete with puff pastry heart on top), and Peach Crisp for dessert. Even better, the food arrives cooked and flash frozen. Simply reheat, set the table with some candles, put on some romantic music…and you’ve got a romantic dinner right at home. 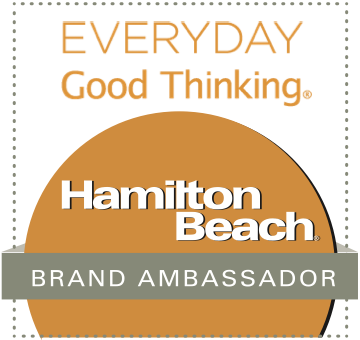 Hancock products are restaurant quality and taste absolutely fantastic. 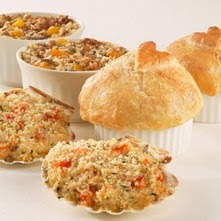 Michael and I went nuts for the risotto and the pot pies…both of which feature huge chunks of sweet Maine lobster. 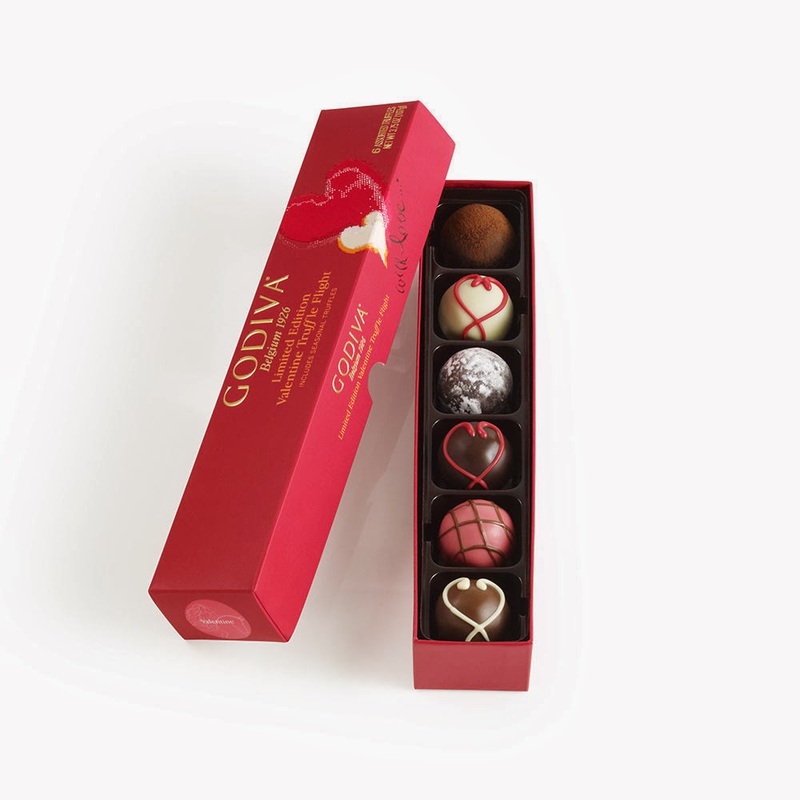 (5) Godiva Valentines Day Truffle Flight and Lovers Delight Gift Set. Face it…Valentines and chocolate are a classic combination! This year, Godiva is offering delicious and adorable Valentine gifts to give the one you love. I’m a huge fan of their themed specialty truffle flights, and their Valentines Day Truffle Flight is amazing. It contains great flavors like Chocolate Lava Cake and Strawberry Creme Tart. If your Valentine prefers her presents cute and cuddly, the Lovers Delight Gift Set is perfect. An adorable 2014 fluffy Pierre the Bear Gund teddy bear is clutching a bag of solid milk and dark chocolate Godiva hearts…and he comes paired with a 19-piece gold ballotin of Godiva classic chocolates. Delicious chocolate and a cuddly teddy bear? Yes, please! These items can be purchased at a Godiva boutique near you…or via their online store. (6) Sur la Table Date Night Cooking Class. Sur la Table offers a wide range of informative and entertaining hands-on cooking classes. Especially fun are their weekend Date Night classes, where couples can learn to cook a fantastic themed feast together…and then enjoy sampling the dishes prepared afterward. Many of the Date Night classes are offered on Friday and Saturday evenings, which are prime date nights! Sample Date Night classes from my local Sur la Table for February include Romantic Italy and Parisian Holiday. Prices vary, but the average is $69-79 per person. 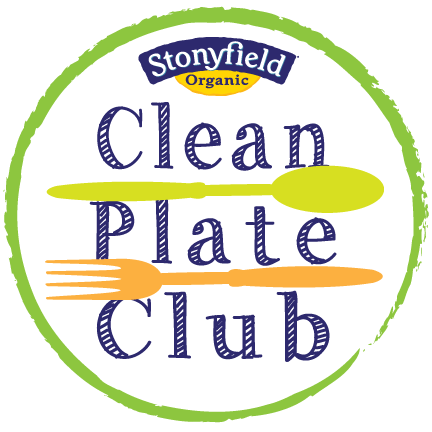 Classes last 2-to-2.5 hours and feature instruction and hands-on experience in a teaching kitchen. Michael and I didn’t take part in a Date Night class, but we had a really great time at the Julia Child Birthday cooking class that we took together last Fall. 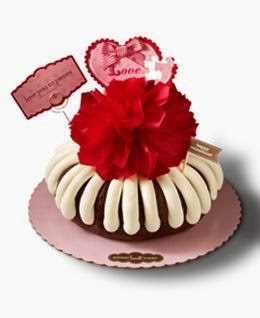 (7) Nothing Bundt Cakes. Imagine moist cake covered in rich, decadent cream cheese icing…then imagine you can enjoy it without dirtying a single baking pan or measuring cup. Sound too good to be true? Not with Nothing Bundt Cakes! They have locations throughout the United States, and they are simply amazing. They come in three sizes: full-size bundts, 2-person bundtlets and 2-bite bundtinis. All three are moist and flavorful and come in flavors, including: Red Velvet, Chocolate Turtle and White Chocolate Raspberry. They’ll even deck them out in cute Valentine-themed decoration like Love You to Pieces, which is pictured! These bundts have a fantastic made-from-scratch taste that cake lovers will flip for…my personal favorite for Valentines is the deep-red red velvet. The bundtinis also make a great Valentines gift to take to the office to share with co-workers. They're sold by the dozen, making it easy to spread a little love to your friends and co-workers! 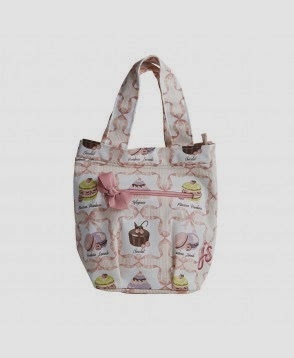 (8) Jessie Steele French Pastries Insulated Lunch Tote. Maybe your beloved is watching calories post-holiday...or doesn’t eat sugar for health reasons. That doesn’t mean that you can’t indulge them a bit for Valentines. This adorable French Pastries Insulated Lunch Tote from Jessie Steele is tres chic…and it will be the talk of the lunchroom at work or school! This feminine tote is decorated with macarons and other French pastries, and it’s the perfect size for taking lunch or healthy desk snacks to the office…or school. The exterior is cotton fabric, but the inside is insulated material that will keep food hot or cold for several hours. I am totally in love with my bag, and everyone oohs and ahhhs over it whenever they see it. Lunch bags can be very utilitarian. Not this one…it’s not only functional, but fashionable too! Disclosure: The items featured in my Valentine Gift Guide provided me samples of their products to facilitate inclusion in this guide. 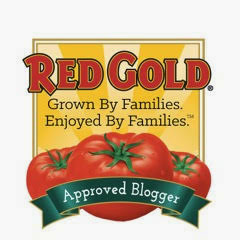 I only share items that I personally have tried and loved, and all opinions expressed are my own.